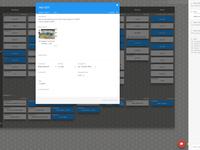 Kanban Tool is a visual project management application for workflow optimization and real-time team collaboration. It helps to analyze and improve your processes, thereby increasing business efficiency. It's easy to use, widely customizable and fast. Available in cloud or on premise. It's the workflow management tool of choice for companies that want a no-nonsense, effective platform, using which requires no training. Kanban Tool Reviews Recently Reviewed! Pros: Flexibility, extensibility, intuitive interface. Cons: Not being able to fully manually arrange to do items. Overall: I was recently on the hunt for a task management tool that I could run separate from the commercial products used at my workplace. This would allow me to add in personal tasks and lower level tasks that weren't appropriate to track in the enterprise boards I was a part of. 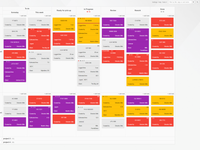 I came upon Kanban Tool and was immediately impressed by the set up options; At a basic level, you already have access to basic, time and event driven Kanban boards, as well as several types of team boards for collaboration. From there, you can further customize the columns, number of lanes, and functions. You can import and export tasks through .csv and and calendar, making everything portable. In practice, I was impressed with the simplicity of the cards on the board. They can be created by color, helpful when trying to manage a bunch of different workflows like I am. At a glance, I can also see the priority, days until due (or past due days! ), and the number of sub-tasks within a card. That's right - You can set up checklists WITHIN the card, which is hugely useful. If you like to have a card for each subtask, you can do that to, and mark subsequent tasks as blocked until the subtask is complete. I also enabled a cool extra that causes cards to "fade" over time, giving another visual cue to things that aren't getting done. Time tracking for each task was a bit of a revelation. Once I got in the habit of shifting every task I was working (The timer starts as soon as you put it in the "in progress" zone), I got really good info on what type of tasks were chewing up time, and even on the fact that I was working on a lot of things throughout the day that I didn't think to track. Finally, Kanban Tool offers what they call "Power-ups", which are basically plugins. The ones I have been really excited about are the ability to attach files to Dropbox or Onedrive, a custom Chromecast feature that allows the board to be cast up to a TV (Great for my family chore board in particular! ), and one that allows you to manipulate checklists without opening cards. In the end, the only real niggle I had with the product was that while I can manually arrange cards in the To Do area (I use multiple swim lanes), one lane can't be longer than the others. I am an enthusiastic product researcher, so I was a bit surprised when my productivity management hunt just lost steam after starting with Kanban Tool. For flexibility and daily use, I couldn't ask for more. Comments: Kanban Tool is truly one of the best Kanban applications I have seen. 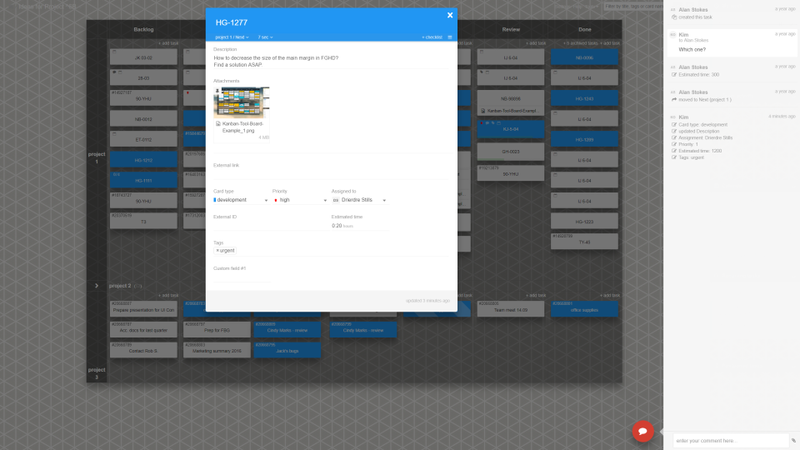 It is definitely a Kanban purist, providing functionality beyond simple boards with drag and drop functionality. It provides plenty of features to make this a very functional application for environments who truly embrace the use of Kanban boards. The UI is simple and clean... nothing fancy, just pure functionality. Pros: Kanban Tool offers true kanban board functionality with an amazing number of features and customization abilities not found in other Kanban products. 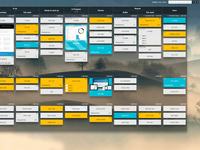 Kanban Tool lets you create Kanban boards of any size and style. Start with a default simple board and expand columns and swimlanes as needed. Customize the cards by various types, as well as customize the fields you wish to display. Kanban Tool starts with 11 fields and lets you add another 15 custom fields. Reconfigure your board and choose from about 2 dozen power up apps to make your experience better. Cons: Kanban Tool avoided the eye candy most other developers often rely on to bring customers on-board. They left well enough alone. No fancy UI's, just truly functional product. In hind-sight, this is not necessarily a CON, but thought it deserved to be mentioned. Pros: Kanban is used by many departments for tasks. Cons: unable to sort tickets visually, search tool can be improved much more to do quick and more in depth search. Comments: Kanban tool does what it claims to be best at facilitating smooth team collaboration in an easy, no-nonsense way. Love the new design they've brought out, love the ease of creating new projects, love the maintenance-free time tracking, love their quick support team. Pros: This is probably one of the 3 easiest to get to know applications I have come across. Cons: Not the best mobile support, I'm afraid. Recommendations to other buyers: If you're pushed for time as far as finding the right app for your team goes - this is what you need. Pros: It's a great tool to improve team productivity. Whether you're in software development, sales, or marketing, it's awesome. 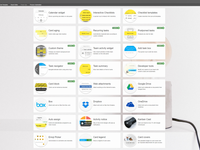 You can easily view everyone's tasks on one board and then assign new ones, rate tasks based on difficulty and time needed, set deadlines, and more. Cons: It is the best tool for project tracking and staying on task and productive. The only little complaint I have is that unless you log in, you can't easily see all the changes that have been made. Overall: Improved efficiency and team output. Pros: I love using this tool because I can easily manage and track the status of my projects. It helps to my team to update their assignments from time to time. Cons: Limited user for the free version. A little bit expensive but worth it for the organizations to make it better. Pros: I like this tool in managing and deliberations of task to my team. I can easily organized the activities and monitor their work. Cons: So far I have no negative experienced in this software. The functions and features are very great and easy to use. Pros: Language and cultural differences didn't slow down the learning of the team. The visual ease of the tool is phenomenal. Recording important files, checklists, due dates, and handoffs became very smooth. Cons: There were older execs on the board that still preferred to see a Gantt chart for the integration of different services. This flies against what Kanban was meant to do. There was no easy way to export a report and create a Gantt chart for others. External reporting as a whole is not easy. Overall: An easy visual for a team that spoke two different languages. There were also members of the sales team that had very minimal experience with project management requirements, documentation, and technology as a whole. The visual ease of this tool created less stress and everyone knew what expectations were required yesterday, today, and tomorrow. What held them up, what actions they had that held others in limbo, and of course the ability to celebrate in unison when the team accomplished a goal. Comments: I have been using KT for over a year. I learned about it in my former company. We used it for project management and managing remote team. The best thing about it is that you can adapt it to your needs and create a perfect board for your work. It is not only about simple Kanban boards. The possibilities are endless. 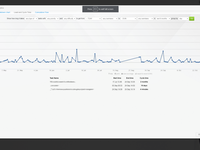 I also like the fact that KT offers very detailed and elaborated statistics and analytics. You can easily share files via KT and synchronize it with dozens of other applications. Now I use it only for me. It is also suitable for personal use. KT is all about elasticity and personalization. I hope my company will introduce it in the future. Pros: We're able to easily manage complex projects. The add-ons give it additional functionality that comes in handy, and we can add anything we need ourselves. Pros: no training was needed - easy to use. Overall: We mainly wanted to use the time tracker, but from a few months' perspective - it seems the overall increase in process visibility has been a huge improvement in how we work. The financial dep. are overjoyed with the possibility to automate recurring tasks - they're working just like clockwork. Overall, very useful application - the not too steep pricing also helps. Comments: I've tried more than 7 of the popular Kanban applications, and this one is by far my favourite. It's to the point, no-nonsense, clear and easy to use, as well as to get used to using over a longer period of time. Cons: I don't know how to remove items automatically from Done column after a period of time. I need to archive each of them. The Done column becomes too big after a while. Sorin, glad to see you're enjoying the service. We recommend using the "archive all" option for the Done column - it is available under a right-click menu on the column header. Looking for a smart way to get away from sticky notes? 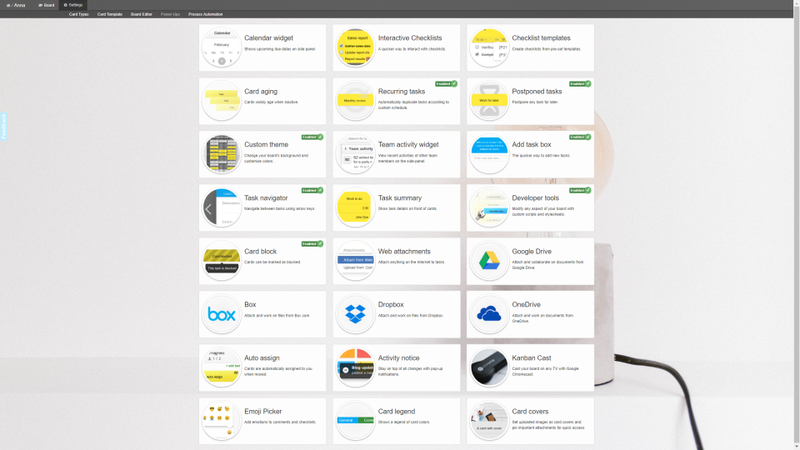 Comments: I use this tool to organize all tasks within our little two person department. I started some weeks ago because I had so many notes in my paper organizer, in Outlook and sticky notes. It takes only minutes to setup and create tasks in Kanban. Since this day my colleague and I are using it every day and can see efficiency increasing already. For our needs a very well developed solution. Thank you. Cons: If you are looking for a simple cloud based tool to get rid of your paper notes and Outlook notifications there are no cons in my opinion. Pros: This software actually gives you columns AND swimlanes. You'll notice almost all of the competitors do not give you that. Managing items is simple as drag and drop, click and type. The online collaboration piece is solid and administration is a no brainer. Overall: We got our project requirements and tasks under control quickly and allowed several stakeholders to "get on the same page" easily, streamlining communication and nailing down requirements. It's hard to imagine what this tool does not have. You can customize fields. Maybe customized reports? I don't know. It seems pretty complete to me. You can really hit the ground running with this tool AND it lets you import your items from Excel or other sources. This tool is very useful in keeping my to do list organized, tracking my time & reporting on it. Pros: I find this tool to be extremely useful. Before using Kanban Tool, my Account Management team has been keeping time sheets that I built in Excel so that we could report on how we spend our time. My department is focused on finding as many efficiencies as possible in how we operate internally and support our clients so that our value can scale as much as possible. Kanban Tool is one of those major efficiencies! Cons: So far, I haven't seen anything I don't like. I am curious to learn about all of the features to be sure my team is leveraging the tool to its fullest potential! Comments: First and foremost - it is clear and intuitive, so you won't have problems introducing it to your team.The creators of KanbanTool took what's best from Kanban method and combined it with seamless time tracking. Integration with other software such as Dropbox, Zapier or Google Drive gives you practically endless possibilities. Great for delegating work, project management and even brainstorming new ideas. Totally recommend it! Cons: No cons for me. Maybe just small one, for me it would be cool to be able to join some sections vertically. Overall: I've tried lots of different Kanban software after using real physical Kanban for a while. This is the only software which make me feel that it's working for me and not the opposite. Cons: Reporting could be alot better and more engaging - i.e Dashboard for different views of the kanban flows, iterations etc. Please note, it is now possible to search through all archived tasks, to easier locate the cards needed. ability to customize the stickies on particular swimlane and category. no much to dislike. i really like this tool. Pros: This tool is very easy to use. With working on a team we could see where we were at with our projects. Cons: I felt that this tool was very elementary for what my team and I were looking for. We tried this product out but ended up going for something more as we needed to share documents and such. Please note, Kanban Tool does support various file hosting services integration, namely: Google Drive, Box, Dropbox & OneDrive. Also, direct file attachments are available in Team and Enterprise plans. Pros: Kanban Tool I recomended, because this tool optimize my work and my team. I had have more control about the jobs and I can see all the jobs together in the tool. Optimize my time and my work. Excellent product for Project Managers across industries. Pros: It has all the features you can find in other platforms. Cons: It has room for improvement (the design). For example, I have also tried RealTimeBoard (awesome design). 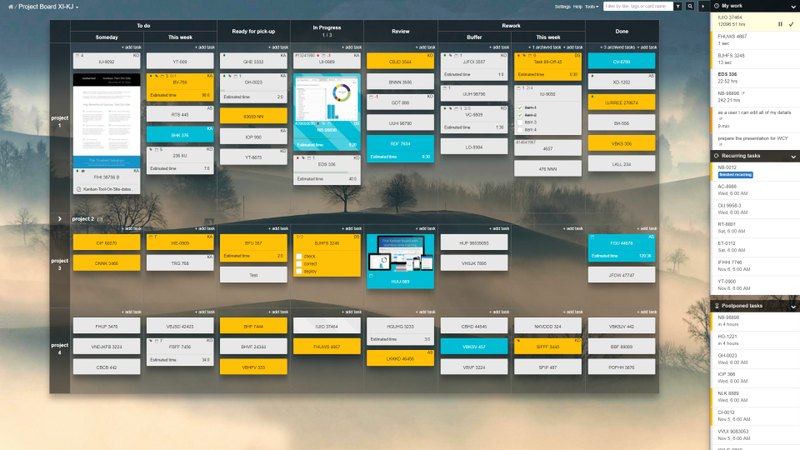 Overall: I have tried Kanban Tool for six months and I can say it has all the features you can expect from these tools and it allows me to be more organized: it is visual, based on colored-notes, drag and drop, you can customize the work flow, for teams, analytics, etc. Take a look a it. Recommendations to other buyers: KanBan Tool is the balance of analytics+design+ease of use. Comments: We use it at my company to manage projects and remote teams. Because of its intuitiveness it was extremely easy to implement. The greatest thing about introducing Kanban is that we don't need so many meetings anymore. 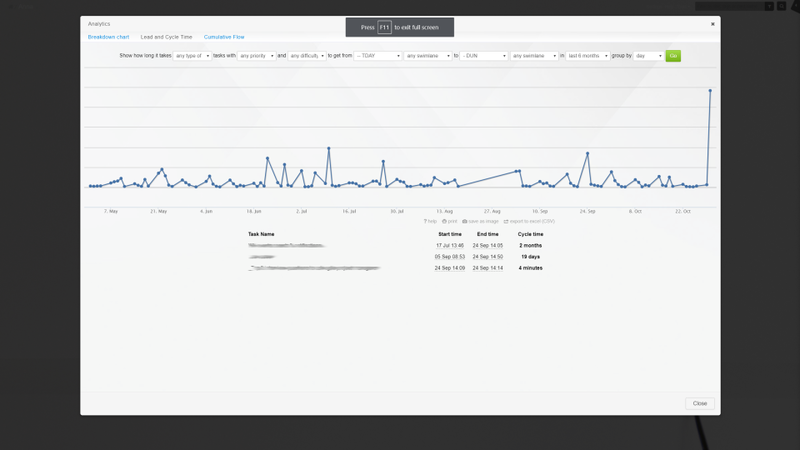 Also, extensive analytics enable to oversee your team's workflow and spot any bottlenecks. Comments: About two months backs I was searching a product using which I could manage my personal work. I found many products and tried using those one by one. In all among them I found that kanban tool is very handy, easy to use, mobile application, excellent customer support.. etc. My overall experience is very good. Good luck team - kanbantool.com. We were looking for a good project management system, after trying others, this one is perfect! Pros: I can manage a lot of tasksfrom a long period of time in the same page. The filter is working very well. The automatic Checklist helps me to not forgot any recurant tasks. Cons: There is no available setting for a target column related to due date. The calendar on the right is small, it would be usefull to be able to open it in another window. Comments: We've been using the app to manage the cooperation with some overseas contractors, and it proved a lifesaver. Such a reduction of communication time and lag, far less misunderstandings and quicker results altogether. Since then, we've never stopped using KanbanTool, even though it's just the local team at the moment. Still increases productivity greatly and keeps things in order. Pros: Easy to use, easy to get started, nice, clear UI, great optional features. Pros: Its quick and easy to use on a daily basis. Overall: I use it only personally, it helps me prioritize and get focused. Right now, card color changes are fastest done by right-click on a closed task, and with the "card type" toggle. We appreciate the feedback and will consider it in the future. Overall: I enjoyed Kanban Tool in the last 6 months for personal and professional use. I have already recommended the tool to a colleague. Pros: I'm a big fan of the kanban process. If you work with design or marketing, it's the best way to organize the workflow. And Kanban Tool is this - a kanban app. Simple and good. Cons: Nothing at all. It's simples, intuitive and free! Comments: My experience with Kanban Tool is very positive. It helps to carry out any type of project, smaller or bigger. Even though it offers so many options and functions, it remains simple and user-friendly. Cons: It should be available in more languages. Comments: Our team started to use this app some months ago and I must say that I am fully surprised how much time it saves and how it improves the organization and communication between the team members. Comments: Kanban Boards was recommended by my teammate as a great application for managing tasks. What I like is that it is a graphical clear visualization and helps me prioritize what I had going on and in which categories the tasks were. Also, I could color code, I do love that! I use the free version... so I don't have a lot of extra features, but I think the free version offers as much features and functionality as I needed! I've used several different tools to manage my work... but finally, I came to the right address. After this, we've just kept on improving the boards and our processes have much simplified thanks to this. I would roughly estimate that our process is bout a quarter shorter now than before - which is a huge improvement in my book. Overall: This application is really great! In my opinion it is one of the best among all available such tools. Comments: Kanban Tool has greatly improved workflow visibility within our company. No more emails being sent around asking who's working on what. It's affordable and useful. So I would recommend this for anyone that needs it. Comments: We have been using Kanban Tool for about 2 years now. This application helps us to work together: to plan and organize everything, share tasks, documents and comments, as well as evaluate our results. Comments: Kanban Tool is one of the most important tools of my company's management system. Very intuitive and easy to use. The whole team likes to work with it! Comments: With a Kanban Tool we are able to deliver complete products in a timely manner. Comments: Simple way to organize tasks and co-work with colleagues by sharing comments and documents. Comments: Just finishing my free trial but as I really liked the experience, I might sign up for one of the plans - the price seems fair for the quality they offer. Kanban Tool is a software based on the well known kanban board method - there are plenty of programs using it, but this one worked out the best for me so far. It's simple yet effective, and has the option of time tracking - really useful! Comments: By far the best project management tool we ever used in our company! 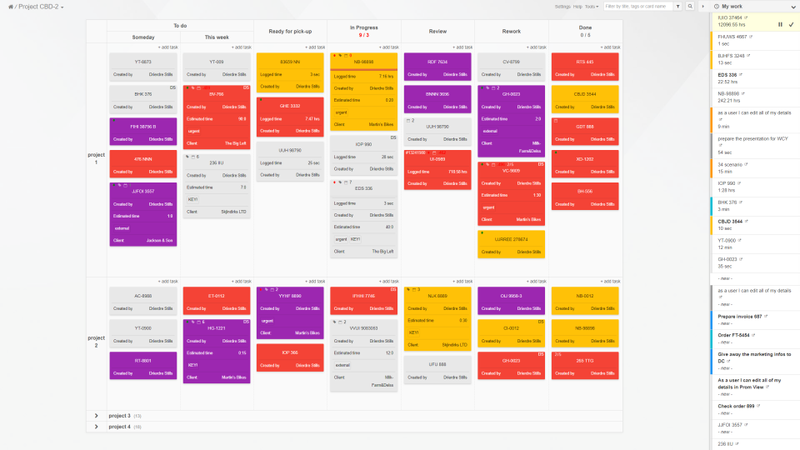 Comments: Thanks to Kanban Tool I can finally organize my personal and business life. Very easy to learn and use. I like the Android app too. Comments: I get to know Kanban Tool at my previous work and I decided to implement it also in my new office. My colleagues are thankful and they say that the tool helps them to solve the time-management problems. And it's easy and colorful so they use it with pleasure. Pros: It is a good projects and task management tool, visual and easy-to-use. But as I've used other tools already, I'm not impressed with this one. It's cheap. Cons: I advise you to try it out and see for yourself if this one fits your needs or not. For us Trello and Evernote are better but you might be delighted by it.